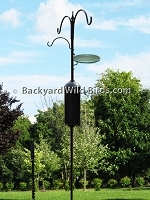 Bird Feeder Station 3 Arm Pole Kit makes an ideal Hummingbird Feeder Station pole and includes two Hummingbird feeders. The two Hummingbird feeders have a built in essential ant guard on top and their large capacity spiral facet glass bottle holds 30 oz of nectar. The 6 port feeders are easily disassemble for thorough cleaning and the wide-mouth bottle opening makes for easy pouring of nectar. Not only will this pole hold these feeders in style but it also has an extra arm to add your own later. 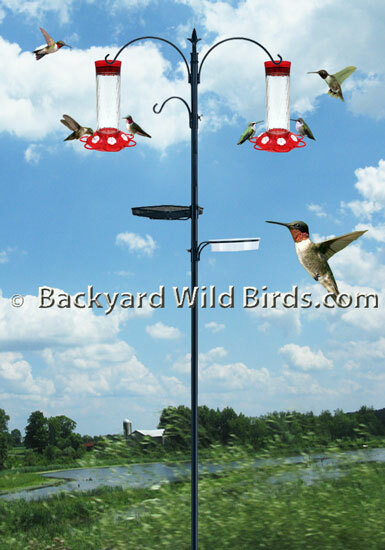 The Bird feeder station includes a set of double hanger arms and one hanger with knob for easy position adjustment. The double arms project 10" from the pole. It is an easy to assemble 3/4" diameter pole that is approximately 6 ft tall above ground. Also includes a pole water/bird bath dish and mesh tray. The Station pole has 3-piece pole extensions constructed of 3/4" powder-coated UV resistant steel tubing and topped with a decorative finial. It overall length is 7 ft 5 inches. When install is 6 ft above ground. It has a durable, black powder coated finish and is a great way to get started feeding and attracting Hummingbirds.